Art and Science are sometimes seen to be two different entities with very separate ideas of what constitutes as research. 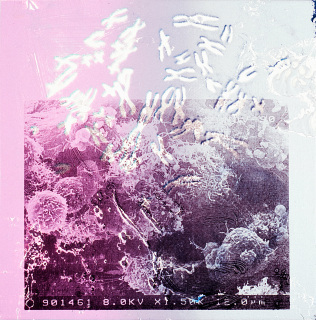 The MA Art in Science program at Liverpool School of Art and Design aims to bring together artists and scientists to explore collaborative approaches in Art/Science research and practice. ​In 2016 Professor Caroline Wilkinson, Mark Roughley, and Kathryn Smith from Liverpool School of Art and Design at Liverpool John Moores University (LJMU) established a taught postgraduate program, titled MA Art in Science. The program is a unique opportunity for artists to deeply engage in the world of science including in the fields of public health, astrophysics, sports science, technology, museum practice, computing, medicine, and forensics, and gives students the ability to explore art/science project briefs in unexpected forms in readiness for application in the world of work. Students have access to a number of different established research centers in Liverpool John Moores University, such as the Public Health Institute, Astrophysics Research Institute, Center in Evolutionary Anthropology and Palaeoecology, Research Institute for Sport and Exercise Science, ARTSLABS, and the Centre for Advanced Policing Studies, and work collaboratively with other students, practitioners, and researchers across art and science disciplines. The first year’s student cohort is made up of students from Fine Art, Illustration, Animation, and Computer Science backgrounds. This interesting mix of previous disciplines has allowed for stimulating interdisciplinary discussions and projects to occur. During the first semester, students had the opportunity to define or enhance their existing practice and extend its scope and ambition through a combination of self-initiated or set art/science projects defined by our LJMU scientific partners. There were opportunities to develop or augment existing skills in digital painting, scientific illustration, and 3D printing and fabrication. 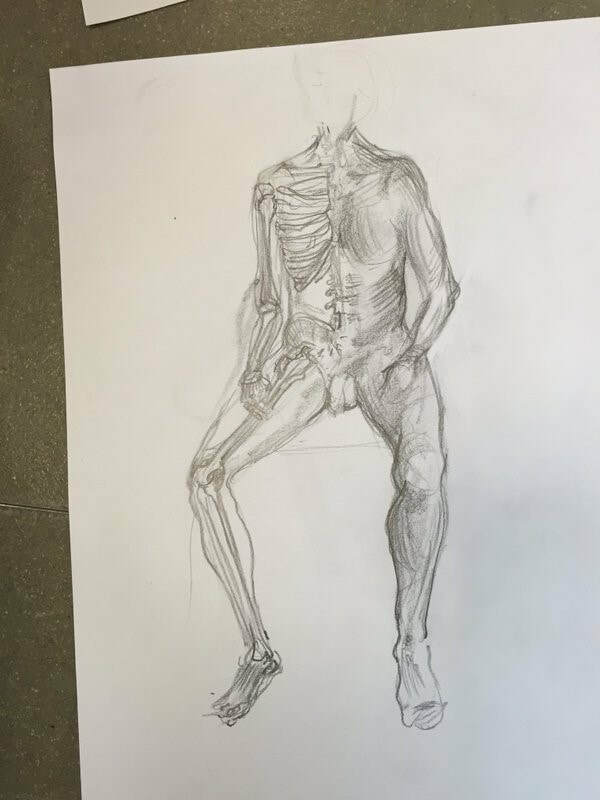 Students also had the opportunity to study Life Art with a focus on human anatomy. 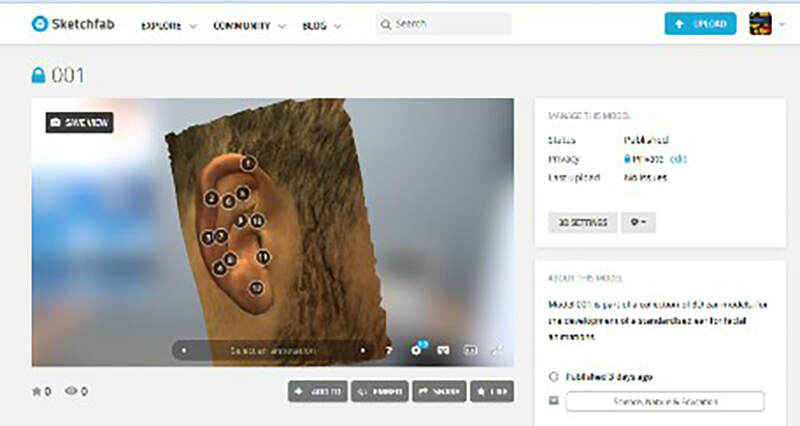 ​One student’s research focus is the face, and they produced a series of virtual sculptures demonstrating how a person who has cluster headaches feels during a headache, with the aim of exhibiting the sculptures as part of the Arte Cluster initiative. Another student’s focus was cryptozoology - myths or products of chance? The student focused on myths with scientific basis such as the Jackalope, human/animal mutations, and the misinterpretation of findings found in examples like dinosaurs during the ‘bone wars’. 3D sculpture displaying how a Cluster Headache sufferer feels during an attack. 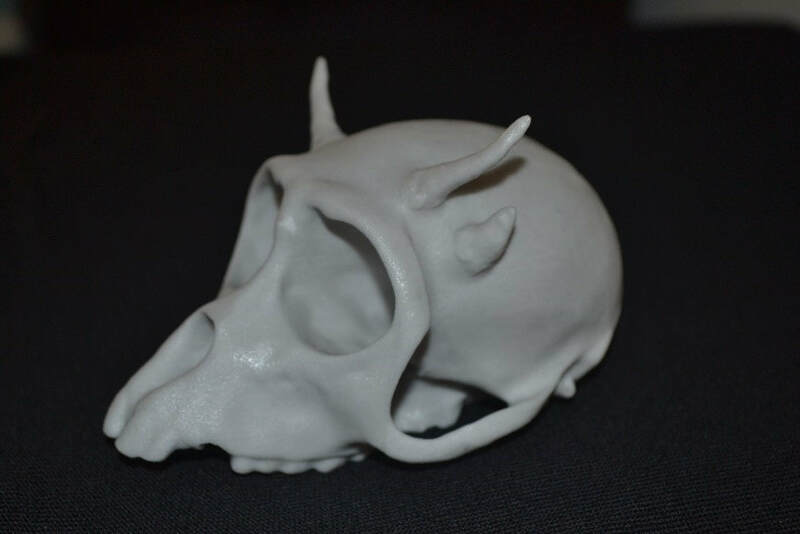 3D print of a ‘horned Rhesus monkey’ – a mythical animal with cutaneous horns. Throughout the taught semesters, guest artists and scientists delivered lectures and workshops to introduce students to a wide variety of art/science collaborative projects and disciplines. There were exciting ethical debates with bioartist Gina Czarnecki; a fantastic discussion with astrophysicists around explaining gravitational waves to a public audience using flora and sculpture at the RHS Flower Show; a thought-provoking presentation showcasing a collaborative African mammal conservation project that allows conservation biologists to use space telescope technology and drones to track animal numbers across vast distances; an innovative 3D printing in healthcare demonstration; an eye-opening injury depiction for legal/courtroom scenarios seminar with forensic artist Ray Evans; and a great wax pathology workshop with anatomical artist Eleanor Crook. Students are also fortunate to have access to Liverpool School of Art and Design’s cultural partners including Tate Liverpool, FACT (Foundation for Art and Creative Technology), and the Liverpool Biennial, plus access to local partners such as National Museums Liverpool and Arts in Health Merseyside. A student works on sculpting the stages of syphilis to a wax face during a wax pathology workshop. 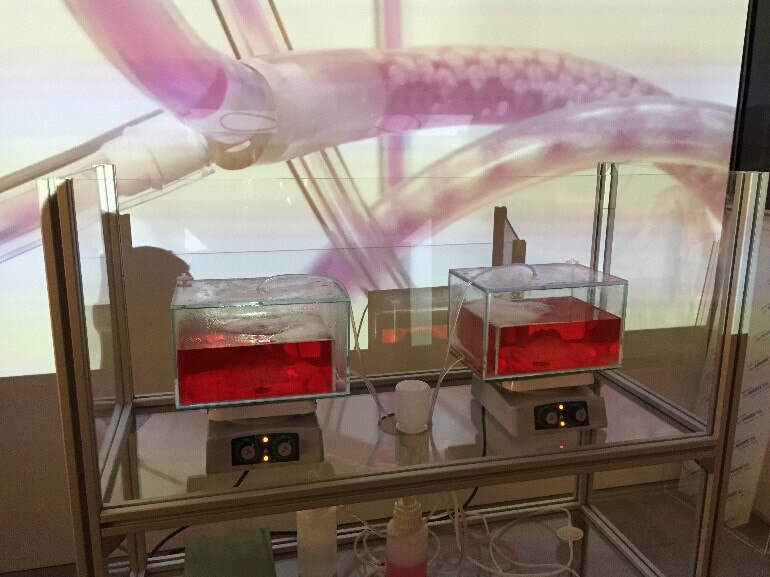 A visit to Gina Czaneckis’s bioart ‘Heirloom’ installation at FACT Liverpool. ​In the second semester students had the opportunity to work closely with internal partners within the School of Art & Design, the wider John Moores scientific community, or with external partners in the U.K. and internationally as part of their “Collaborative Practice” module. Through key partnerships, students are able to engage with a range of collaborative projects which challenge the notion of the interdisciplinary practice within the context of the contemporary art and design, and which enable them to propose, plan, organize, publish, and promote their work within the context of an external body. This module is shared by the six taught postgraduate programs at Liverpool School of Art and Design and allows students to collaborate across programs. There were opportunities to work with students from the other postgraduate programs and a scientific partner on live projects, concepts, or active research. Some students from the postgraduate cohort collaborated with astrophysicists from the Astrophysics Research Institute on communicating astrophysics concepts to public audiences, and stem cell biologists from the Stem Cells, Ageing, and Molecular Physiology Unit to create a 3D printed support structure to help grow muscle fibers for potential use in muscle repair. One student worked on creating a 3D database of teeth looking at tooth modification – by disease or design. 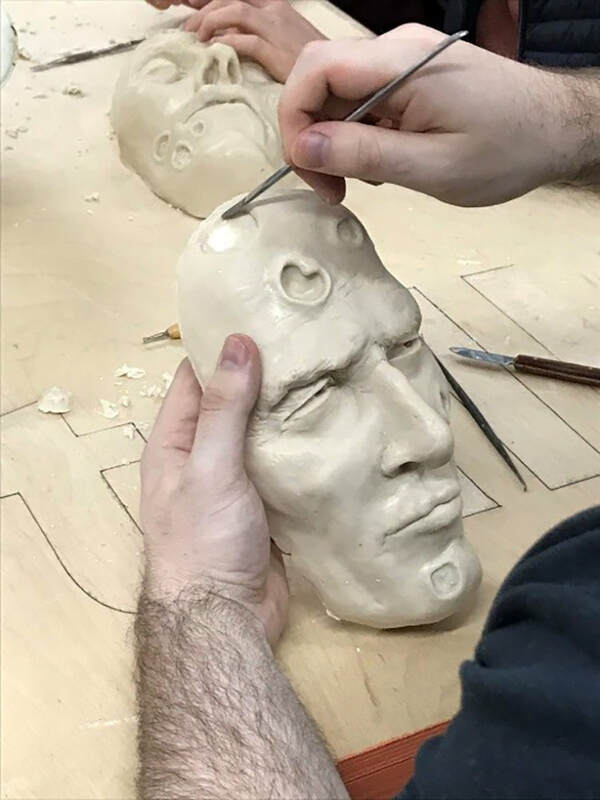 Others worked on facial animation research projects with the Face Lab research group, collecting and interpreting data through biometric analysis, 3D printing, and animation. The MA students presented their collaborative practice work in a pop-up exhibition. Collaborative Practice exhibition – pop up exhibition displaying work from all MA students studying programs at Liverpool School of Art and Design. 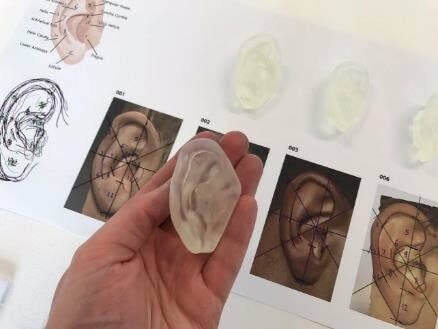 Collaborative project – The creation of a standardised non-identifiable ear for interchangeable use in facial animation projects (biometric analysis, 3D prints, annotated 3D ear models). Collaborative project – Tooth modification by disease or design (3D sculptures, 3D prints). 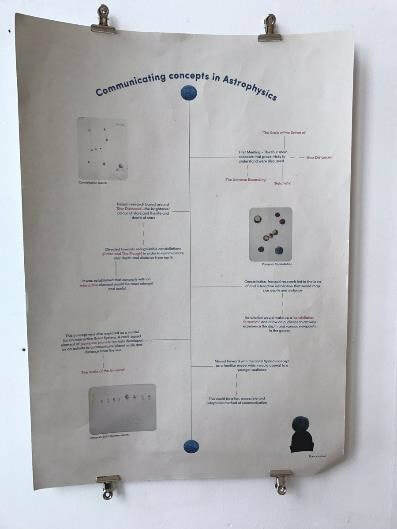 Collaborative project – Astrophysics concepts ‘Scale of the universe’ public engagement materials (a woollen solar system). Collaborative project – Astrophysics concepts ‘Distance and Light’ public engagement materials (screen prints, pocket booklet). As we move into the final Major Project, students are preparing to investigate new areas of art/science practice-based research, bringing together the skills and knowledge that they have acquired throughout the program, and undertake and complete a sustained and novel art/science project. We are eager to see what exciting collaborative outputs emerge. Mark Roughley, Module Leader MA Art in Science, Liverpool School of Art and Design Mark graduated with BA (Hons) Illustration with Animation from Manchester School of Art and went on to specialise as a Medical Artist, having gained his MSc in Medical Art from the University of Dundee. Mark has worked previously as a lecturer in Medical Art and a Medical Illustrator within medical and dental schools. Mark now teaches on the MA Art in Science programme at Liverpool School of Art and Design, and is module leader for the Studio Practice, Research and Practice and Major Project modules. Mark is also a member of the Face Lab research group at Liverpool School of Art and Design, and specialises in visualising anatomy. 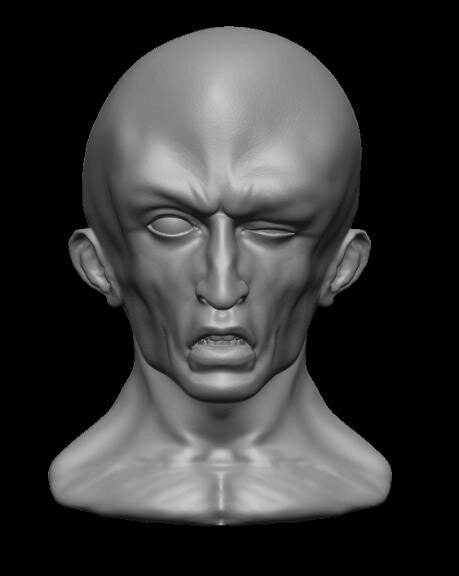 His 3D modelling, texturing and animation skills, alongside knowledge of CT/MRI data reconstruction practice, 3D scanning and 3D printing are used to aid in Craniofacial Reconstruction and for presentation to public audiences. Mark’s research interests focus on interdisciplinary Art/Science practice and collaboration. Kathryn Smith, Tutor MA Art in Science, Liverpool School of Art and Design Kathryn Smith is a doctoral student and graduate teaching assistant at Liverpool School of Art and Design's Face Lab. 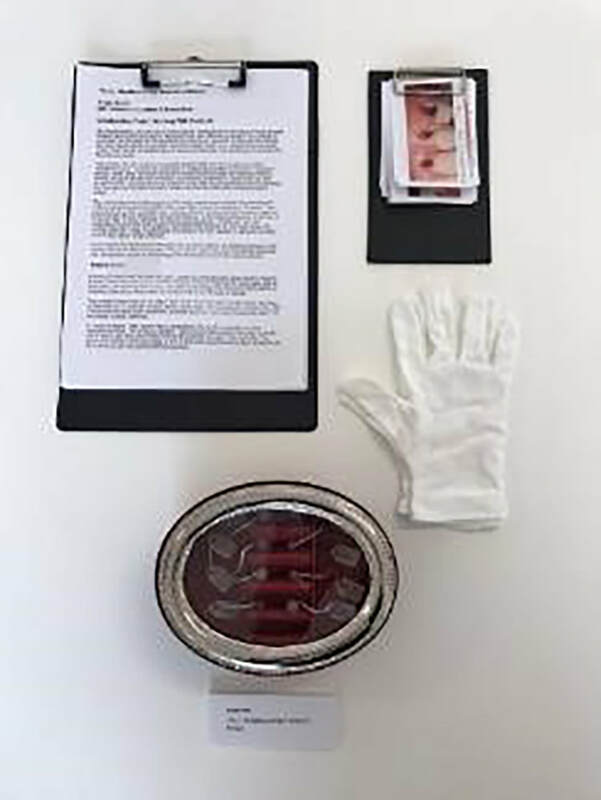 Her PhD project 'Laws of the Face' explores practices and attitudes to depicting the post-mortem face. She holds an MAFA from Witwatersrand University and MSc Forensic Art from the University of Dundee. She has previously worked as a Senior Lecturer in Visual Arts at Stellenbosch University. Widely published in the fields of visual art and curatorial practice, she is currently co-investigator on 'Poisoned Pasts', a collaborative multimedia research project exploring the visual potential of the Project Coast archives. She has curated a number of high-profile exhibitions in South African public institutions and has been commissioned to research and write several monographs and anthologies on contemporary South African art and artists. ​Professor Caroline Wilkinson, Programme Leader MA Art in Science, Liverpool School of Art and Design Professor Caroline Wilkinson is the Director of Liverpool School of Art and Design, and programme leader for the MA Art in Science programme. She has a background in art and science and her research and creative work sits at the forefront of art-science fusion and includes subjects as diverse as forensic art, human anatomy, medical art, face recognition, anthropology, 3D visualisation, and craniofacial identification. 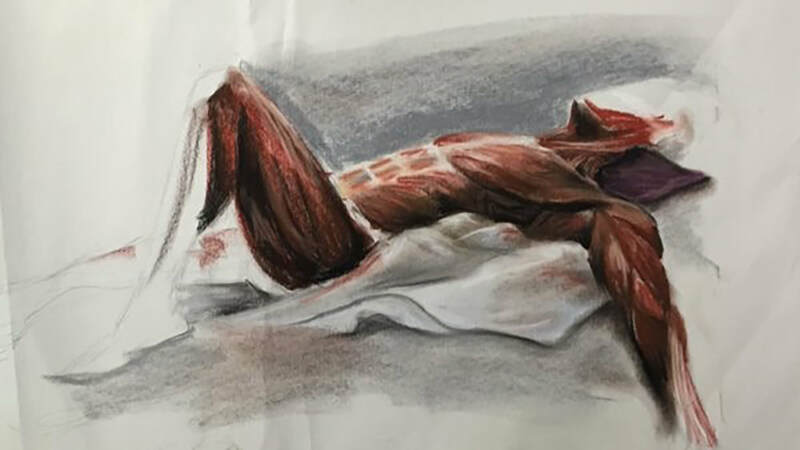 Caroline is a graduate of the University of Manchester, where she also led the Unit of Art in Medicine, and previously worked at the University of Dundee, where she was Head of Human Identification in the award-winning Centre for Anatomy & Human Identification. Caroline is the Director of Face Lab research group that carries out forensic/archaeological research and consultancy work including craniofacial analysis, facial depiction and forensic art. Her high profile facial depiction work includes facial depictions of Richard III, St Nicolas, and Robert the Bruce.